I don’t know who first decided to thinly slice a piece of potato and fry it, but whoever you are, thank you. Potato chips (or crisps, if you’re my pedantic British cousins) are kind of the best snacks to munch on, especially on a lazy day. Up this to a hundred when it’s summer: My sunny beach memories all have the sharp crunch of a chip being eaten as its soundtrack. My love for chips started with potato chips, but it’s evolved into an appreciation of some of the more…unique stuff. Sometimes, that simply means potato chips in weird flavors (blame it on my early predilection for sour cream), but that also means chips that aren’t made with that tuberous crop but are just as good and crunchy. It’s summer, and since summertime is the time for adventure (à la Phineas and Ferb), here are some unique chips you try chowing down. Crackle is a local potato chip brand (if you’re a big bazaar hopper, you’ve probably seen it before). The brand has some pretty interesting stuff: Aside from the Bicol Express chips, they have salted egg-flavored potato chips and chicharon. Still, it’s the potato chips inspired by the Bicolano dish that you should try out. Described as a “spicy coconut” flavor, the chips are generously coated with a powder that clearly evokes the dish, being just spicy enough without overpowering the gata-flavoring. I tried this out with my Bicolana friend and she gave this her seal of approval, which should say something. 2. Crunchy isaw chicken by Pogs! I like to think that a country’s street food is representative of the country’s cuisine, if unrefined. In the case of isaw, it shows our cuisine’s characteristic need to use all parts of an animal (it being chicken intestine), as well as our taste for the savory-sweet. Inspired by this, the N.C. Hernandez Food Products released a packed street food line called “Pogs! Pinoy Street Food in a Pack.” Unlike the ones on the street, their snacks are crunchier and cleaner—while still retaining that distinct flavor. They have multiple products, but my money’s on, of course, the crunchy isaw chicken. Let me start by talking about fish skin. Popularized in 2017 by the Singaporean brand Irving’s, this crunchy salted egg snack became wildly popular in the country—popular enough for the local company Frabelle to step in and offer an easily accessible version. (Read: A seafood company just made salted egg fish skin available for the mass market) Just this year, the company released similar chips familiar to any bar-hoppers: chicken skin. 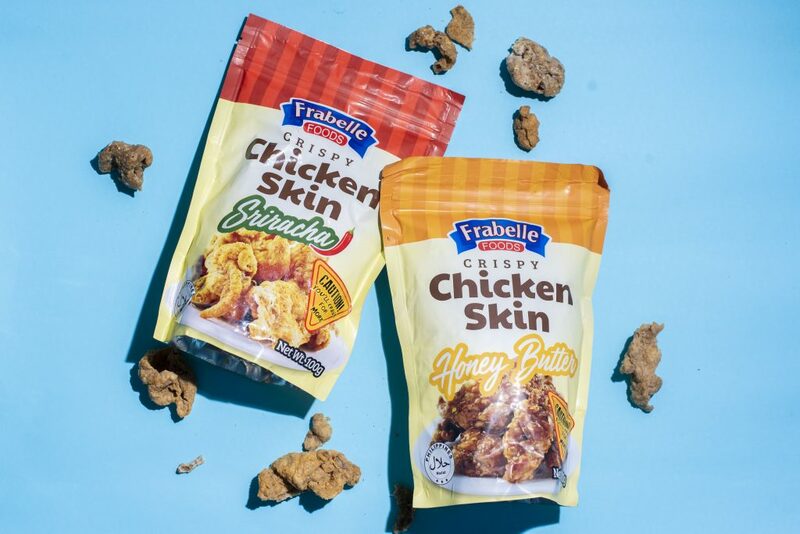 Packaged fried chicken skin is really the logical conclusion of the local fish skin trend, if you ask me. It has the same kind of crunchiness of the fish skin, but it also evokes a popular local snack. Frabelle’s comes in different flavors, but my favorite was the sriracha flavor. It was the right amount of tangy and spicy. You’ve heard of chocolate-covered potato chips, so here’s something a little bit more out there: chocolate covered crispy dilis. 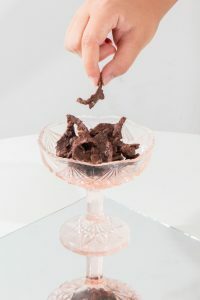 It’s a homemade snack inspired by the iconic champorado and dilis breakfast combo, and you really just munch into it the same way you would a regular potato chip. In truth, it took a bit of some getting use to, especially with the slight lansa of the fish. Still, it was a good snack and I’m pretty sure I ate it all in one day. Oops. So, I’ll say this right now before anyone screams at me. I’ve always thought that these little garlic slices were just condiments, too, but apparently you can munch on these in a pinch! At least, that’s what my fellow content creator, Christian San Jose, said, so please direct any of your food purist concerns to him. Crispy garlic chips are, well, garlic chips. It’s a “what you see is what you get” kind of situation. If you’re the type to order extra garlic on your garlic rice (or maybe have a vampire in your house? ), then take a bite of these chips.